The idea behind the Super Muscle System is a suspension damping design that is able to be both plush and firm in a way no other system can. The design stemmed from always having to compromise on between square edge compliance and big hit control. Typical shim-piston designs only allow a system to work efficiently in partial ranges performance and control. When tuning the suspension to be plush over square edge bumps, shim systems must be soft, allowing the suspension to blow through the stroke on larger impacts. Unfortunately, this in turn causes the suspension to bottom out hard and often. If the shim stack is tuned to hold up for g-outs and large impacts, the result is unwanted harshness potentially causing the rider aches and pains. Shims also tend to warp over time causing damping changes that affect the performance, most notably at low speed movements where shims don’t hold a tight seal anymore. Blow-off valves have been employed by many tuners and OEM manufacturers with only minor improvements found over basic shim and piston designs. Blow-off valves allow the entire system to release pressure when a sharp spike like a pothole is encountered. However, this usually causes cavitation in which the rebound and traction are tampered with. The downside is that this allows uncontrolled compression, allowing the suspension to blow through the stroke and lose traction. Additionally, blow off valves create a speed range limitation. As long as a rider holds one speed over one style of bump, they will have consistency. Change or ride/drive more aggressively and the damping character runs out of tune capability quickly. Keeping brand new shim stacks will widen the usage area, but the rider would need to replace them after every ride to keep the edge like pro racers do. Spool valves are a much newer damping technology but they are a minor advancement over shims. This expensive valve provides damping curves that mimic shim stacks and offers no performance advancement other than a more consistent design. Adjustment for damping curves requires replacement parts as they rely heavily on port shapes and sizes. Cone valves are slightly similar to spool valves. By replacing shims, they become more consistent from a manufacturing and longevity standpoint. Cone valves generally feel like a shim stack with a blow off. They feel plusher over harsh bumps but tend to blow through the stroke and use up their travel while not being as detailed over chatter. Imagine jumping off a high platform and into a shallow pool. If you dive in like an Olympic diver with only a pointed dive angle, you will pierce through the surface very smoothly but will maintain too much speed and slam into the pool floor. If you jump off and do a belly flop you will be welcomed with a very harsh slap to your body, but you will not hit the bottom like before. This is a great analogy to illustrate the performance compromises of all major damping designs that are purely speed sensitive. The N10Z™ valve operates like no other system. This time, imagine jumping off and diving in, but as soon as you pierce the surface, you curl and redirect your momentum to stop your decent. This gives you a plush entry with no harshness and eliminates slamming into the bottom. The Super Muscle System created by the N10Z™ valve does exactly that for suspension systems. 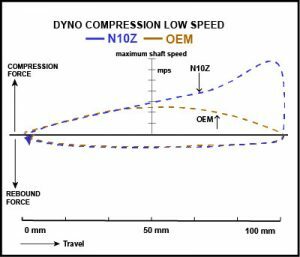 The N10Z™ valve is the first time-sensitive damping system. It brings suspension from a 2D world to a 3D world. No longer is damping just dependent on shaft speed and position, but now time. When your wheel initially impacts a bump, it is open and plush allowing the wheel to properly retract without harshness. Milliseconds later, it stiffens inside, gradually, yet with force and strength; this is the muscle that stops the suspension from compressing uncontrollably. The N10Z™ valve is designed as a fully active component that constantly adjusts itself to absorb the impacts while maintaining traction and bottom out control. It is not a reactive system like electronically controlled suspension, but is active and works on its own to provide immediate response without waiting for a computer to give commands. Electronic adjusters have been used to improve the piston-shim performance. The issue with these systems is they are purely reactive. They only adjust after contact with a bump or surface is made. 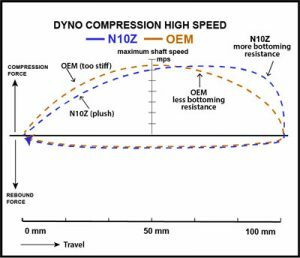 The N10Z™ valve’s design allows it to have the right damping prior to impact. This makes the entire sequence, impact to rebound, smoother and more controlled. While the function of the valve provides damping performance no other system can obtain, it still has a simple adjuster screw. Not all terrain is the same and not all athletes prefer an identical feel. The adjuster controls the plushness throughout the damping range to give each athlete what he or she desires for their skill, speed, usage and terrain preferences. No internal adjustments are necessary. There is just one simple clicker adjustment. No more black magic behind low, mid and high speed changes as the N10Z™ takes care of that for you. Low speed (car roll in corners, G-out, and lack of force increase) strength/power and longevity are weak in the standard shock system and requires the use of sway bars, heavier springs, and stiffer valving and smaller ports to accomplish a decent amount of control. For the average person to understand, this means your suspension will be less plush, less long-lasting, you will be less confidence at railroad crossings, G-outs, curb angle entrances, and have less cornering speeds. This poor performance is especially true after the shocks get slightly broken in. N10Z™ fixes all areas of slow speed deficiencies. Slow speed characteristics actually need to be ramped up by almost 150 – 500%. However, in standard valves this would be impossible. It would be like having NO suspension, or solid suspension. N10Z™ has a system that knows when the suspension is moving slow and accurately forces itself to amplify to any rate that the builder desires in the setup. Yet the vehicle can settle and be relaxed over little bumps as if the suspension is super plush. Medium Speed (chop, small jitters, little ripples, ribbed gravel roads) damping is all about having a dip in the initial movement of the travel. This system of control must be light enough to remove the smaller pulse of energy, and amplify fast enough to stiffen, while also helping the wheel to get back to the ground faster than the spring itself can push. A standard shim system will not be super soft of stiffen fast or place the wheel to the ground in a fast manner. The best the standard system can do is be over sprung and under dampened. As for sway bars they add a sling shot to the wheel if the bumps hit the left and right tires at different times. Chop has to allow for a shock to move at record speeds for a small amount of time, both for rebound and compression. If you amplify damping to fast, then head shake or sliding occurs. If you don’t amplify the damping fast enough the traction pressure is lost because it is either to stiff or to flat of a curve. N10Z™ knows how to progress the curve and its built in spring pump that is pressing on a spring in the valve to stiffen damping also allows for a pressing back to the ground at a faster rate due to its loaded return. This would be the same as if you have a ball on a stretchy string, as it flies to the end of its travel it slows then lags for a split second, then returns the other direction. Now if you add a stiffening and then a small bump to change its direction at the end of its stretch, you have essentially switched directions at a higher rate of speed. High speeds need to have what we would call dive angle. The High Speed is where you contact the bump and the shock has to move very fast. Imagine diving off a large cliff with your hands pointing together at the end. After you break through the water’s surface, you spread out and slow down. Now imagine being able to spread wider than your own body. N10Z™ has taken this concept, engineered it so the force entering a bump is incredibly smooth, while still keeping the spreading or slowing action drastically firm. In the end, the driver does not feel nor notice the bump because, just like the diver slowing down in the water, it’s a smooth transition. Imagine diving with a 2ft wide plate in your hands and hitting the water! Ouch! Now that is what firm standard concepts overlook. High speed (pot holes, gravel road chop, steps or bigger bumps) damping control and stroke control are at the opposite ends of the spectrum of low speed. This is where the standard shocks have to “fight” all the characteristics built and used to enhance the slow speed are of valving. Those standard valves need high blow offs which take away all ramp-up effects due to the harsh nature of the high drag, stiffened springs, and stiffer valving. Basic valve designs have too much seal to allow for the initial soft absorption of a sharp bump, followed by lack of stroke control after the tire hits a bump or pot hole and blows through the stroke swinging energy into the fender with the “throw” energy. This almost feels worse than the initial hit. The end result is always uncontrolled damping adding amplified looseness to the problematic areas when the shim systems weaken resistance. 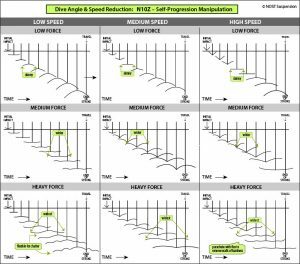 This brings us to the issue of shim fatigue and oil breakdown; yep, they just can’t hang with the performance needed to stay proper for any long period of time when fighting themselves against energy forces, and they certainly don’t grow in tension as the speed slow from the damping effect. 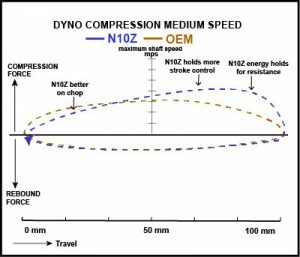 N10Z™ does manage a slowing curve seen here where the tension increases even after the damper has slowed down.